On Sunday 31at August Janie Caesar is participating in the Prudential Cycle Race. She aims to raise finds for our Medic One Charitable Trust. She has already raised £2000, but we would love you to donate even more over the next few days to show our support to her. "For my 60th birthday I ran the London Marathon to raise funds for the Hospice. I have just had my 70th birthday and am raising funds and awareness for Medic One by cycling 160k on the 2012 Olympic Route on 31 July 2016. Training in all weathers is hard, asking for much needed donations is harder but the giving is easy! 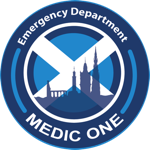 Medic One rely on donations to enable them to continue with the vital work they do. Equipment and drugs carriedby Medic One are similarto those used in the Emergency Department, allowing the team to undertake advanced medical care at the scene. The intervention of Medic One has not only saved many lives but also helped trauma patients survive with a meaningful quality of life. Please support my efforts by donating to this very worthwhile cause." Newer PostPain of the Soul?